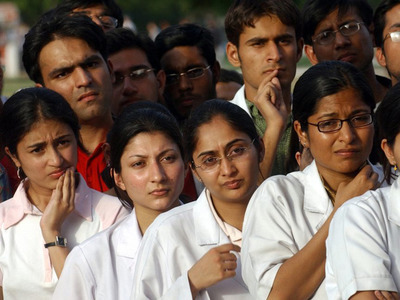 NEW DELHI: The 12-hour nation-wide stir called by the Indian Medical Association(IMA) to protest a proposed legislation seeking to replace the Medical Council of India (MCI) with a new body, was called off on Tuesday after the bill was referred to a parliamentary standing committee. The committee has been asked to give its report before the Budget session. The National Medical Commission (NMC) Bill, which was tabled in Parliament on Friday, seeks to replace the MCI and also proposes allowing practitioners of alternative medicines, such as homoeopathy and ayurveda, practise allopathy after completing a "bridge course". "We called off our strike as the bill has been referred to a Parliamentary Standing Committee which has members from diverse fields and there should now be a fruitful discussion. We are thankful to all the Lok Sabha members for supporting us," IMA's K K Aggarwal, who was spearheading the stir, said. The strike called by the IMA went on for around eight hours today. The bill was referred to the committee following protest from the opposition parties as well as doctors. The IMA has been strongly opposing the NMC Bill saying it will "cripple" the functioning of medical professionals by making them completely answerable to the bureaucracy and non- medical administrators, and has declared today as a "Black Day". Earlier in the day, Union health minister J P Nadda said in Parliament that talks were on with the IMA to clear their doubts. "Talks are on. We have heard them (the doctors) and also presented our views," he said. "This (bill) is beneficial to the medical profession," Nadda said in the Rajya Sabha after the members raised the issue of strike by the doctors across the country. Senior Congress leader Jairam Ramesh had written to Vice President M Venkaiah Naidu and the Union health minister demanding that the bill be referred to a standing committee for examination. "The NMC Bill in the present form is not acceptable. This bill is anti-poor, anti-people, non representative, undemocratic and anti-federal in character," newly-appointed IMA national president Dr Ravi Wankhedkar. IMA has already written to Prime Minister Narendra Modi and the Union health minister urging them to redraft the bill and rectify some of its provisions to protect the interest of medical practitioners. It claimed that the provision in the bill which allows AYUSH graduates to practise modern medicine after completing a bridge course will promote quackery. The NMC bill proposes replacing the Medical Council of India with a new body and "possibly" Section 15 of the IMC Act, which says that the basic qualification to practise modern medicine is MBBS, Dr Aggarwal, the former president of the IMA, had said. "It (the bill) takes away the right of every doctor in India to elect their medical council," he had said. Dr Wankhedkar had said, "The bill purported to eradicate corruption is designed to open the floodgates of corruption. A bill to regulate the medical education and medical practice without the concurrence of the medical profession will be a disaster." Clause 49 of the bill calls for a joint sitting of the National Medical Commission, the Central Council of Homoeopathy and the Central Council of Indian Medicine at least once a year "to enhance the interface between homoeopathy, Indian Systems of Medicine and modern systems of medicine". The bill proposes constitution of four autonomous boards entrusted with conducting undergraduate and postgraduate education, assessment and rating of medical institutions and registration of practitioners under the National Medical Commission.